2015 Leaf Ultimate Draft Football is another all-autograph release from the card maker focusing on the 2015 NFL Draft class. While 2015 Leaf Metal Draft takes a chromium approach, Ultimate Draft opts for a more high-end feel. Boxes come with five autographed cards. Ultimate Autographs are, essentially, the product's base cards. While the overall design is somewhat minimalist, they do use colorful etched foil at the tops and bottoms of the cards. 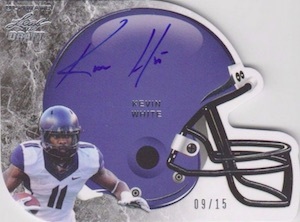 Ultimate Helmet Die-Cut Autographs use the piece of football gear as the central design element. The cards also include images of the player. Rounding out the card types are Ultimate Numbers Autographs. These also use etched foil to highlight key college stats of featured players. All three levels of cards have multiple parallels that are numbered as low as 1/1. 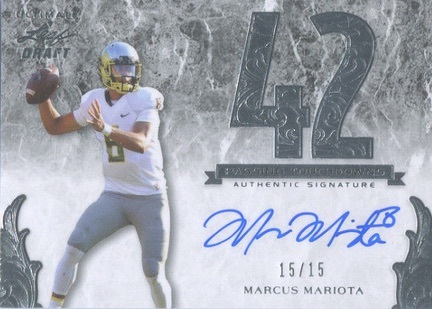 Heisman winners Marcus Mariota and Jameis Winston are among those with autographs in 2015 Leaf Ultimate Draft Football. Other signers include Todd Gurley, Amare Cooper and Duke Johnson. 2015 Leaf Ultimate Draft Football is limited to 199 12-box cases. 76 cards. Serial numbered #/99 or less. *Redemption cards are noted. Jaelen Strong has both live cards and redemptions. 10 cards. Serial numbered #/40. 13 cards. Serial numbered #/40. Love what Leaf is doing. Finally a manufacture run by a collector giving other collectors what they want. Rarity only 199 cases, LOL you will never hear that from Topps or Panini at the price Leaf is giving to you. I heard a guy busted 50 Bowman cases just to get a Kris Bryant superfractor just by himself. How rare were those other base autos he busted on a 4000 case product. Plus the checklist is full of all the top talent and sleepers. And it’s on card autos with no throw away base. Five on card autos for $100 on the rarest product this year. HELL YA count me in for a box to break while I watch the draft!!!! Awesome product. Can’t wait for the NFL Draft Thursday. Love the design of the card and how inexpensive they are per box. The 5 autos also make this a autograph collectors dream without paying outrageous prices for other products with way less hits. Best resale value to date. Five autos for $106 and selling really good. Resold most of my case and made an easy profit. Hit Winston and a Shane Ray /99. Just sold half of my case and got my money back easy. Now using it to build the set. 2011 Leaf Ultimate Draft FB HOBBY Box 4 Autograph (Cam Newton JJ Watts Green)?